Methane – damned if you do, dammed if you don't | Watts Up With That? Researchers at Brazil’s National Institute for Space Research calculated that the world’s largest dams emitted 104 million tons of methane annually and were responsible for 4 percent of the human contribution to climate change. Eric Worrall writes: A new study performed in Laos suggests that building Dams in tropical locations exacerbates climate change. Since hydro power is the only renewable which is anywhere near reliable and predictable, this shock discovery pretty much eliminates renewables as a low carbon electricity option. With a massive dam under construction in Laos and other dams on the way, the Mekong River is facing a wave of hydroelectric projects that could profoundly alter the river’s ecology and disrupt the food supplies of millions of people in Southeast Asia. By: Melinda Boh Friday, April 12, 2013 This article originally appeared in Asia Times Online. VIENTIANE – It was once referred to by US magazine Newsweek as a “kinder, gentler” type of dam. Since the Nam Theun 2 hydropower dam commenced commercial operations in 2010, the World Bank and other proponents of the multi-billion dollar power project have trumpeted it as an economic and social development success story for host country Laos. But with the negative publicity and diplomatic tussles now focused on the proposed US$3.5 billion Xayaboury dam, which if built promises to hurt downstream communities and the environment in Cambodia, Laos and Vietnam, Nam Theun 2’s emerging failures have largely escaped critical scrutiny. In particular, there are rising indications that Nam Theun 2 and its massive 450 square kilometer reservoir are responsible for massive amounts of greenhouse gas (GHG) emissions, amounting to as much as one million tons of methane and carbon dioxide per year, according to recent independent academic studies, including a statistical assessment produced by the US’s Duke University. If accurate, that figure is substantially higher than the level of emissions initially estimated in the project’s environmental impact assessment. Researchers from Toulouse University in France have concluded that Nam Theun 2 produces in excess of 40% of the GHG that would be emitted from a coal fired power plant of equivalent energy output, and far more than a natural gas-fired plant. Oh Noes! Those people might have electricity for the first time. We can’t have that. What about all the dirty cooking fires, air pollution, and deforestation for firewood that dam will prevent? Meanwhile, methane continues to be pretty much a non-problem, and reality isn’t meeting the expectations of IPCC models. Imagine if environmentalism had the reach it has now in 1776, we’d all be living in sustainable tenements in Boston. Even the Boston Tea Party wouldn’t have happened, for fear the the Colonial EPA might fine them for polluting Boston harbor. September 12, 2014 in Alarmism, Methane. The way greenie-tech seems to backfire, I’m soon expecting a discovery that pinwheels increase methane emissions by scaring the sh*t out of nearby birds. You couldn’t make this s*#t up if you sat around all night trying to think of the most bizarre nonsense you could imagine. What if I sat up all night huffing methane? ARRGh!, now I have to spend hours scrubbing the visualization from my brain! The estimated beaver population of Canada last I heard is around 3 million animals. Each one of them “HAS” to fell trees and timber or their teeth will grow right through their jaws. They build dams and flood acres of land, killing millions of trees a year. It does not matter if a pond is a few hundred feet deep, or only one or two, it still kill all the trees it floods, and they still decay and release methane. Boy, do they ever. You will never hear an environmentalist decrying their impact however, or calling for a cull of the population. Because they are natural. And their ponds form valuable wet lands and fire breaks, as well as storing valuable water against dry weather. What I don’t understand is why all these benefits don’t apply to hydro reservoirs. Simple, beavers are cute only mann is evil. Dam! Their power of fail is stronger than I imagined. I thought they concentrate on failing temperature forecasts. The have’s telling the have-not’s all the things they can’t have because the have’s are so benevolent and messiah-like in their saving actions. So I say, You go Laos! Rock your world! Yup. I’ll see your Mekong and raise you one Louisiana. I’ll keep my Dismal Swamp up my sleeve. The scaremongering using the super satanic gas methane originates from the Greenland ice cores, where pCH4 corrolates strongly with the d18O spikes, most notably during the last glacial transition. There is, however, no corrolation of both records with pCO2. On the other hand the d18O record of the Antarctic ice cores corrolate strongly with the lagging pCO2 but neither with the methane records nor with the Greenland d18O records in the ice cores. So if both methane and carbon dioxide are global proxies for greenhouse effect, why do we only see one hemisphere corrolating and why is there such a difference in changing temperature between the both? Logic dictates only one answer: d18O from ice cores is not a global temperature proxy and CO2 and CH4 are not globally forcing temperatures. Moreover the IR absorbance of CH4 is on the edge of the Earth IR radiation profile and it saturates quickly. However due to the very low concentration, changes are relatively large. However a bit larger change of just about nothing is still just about nothing. Nothing to see here. And then there’s ONE MILLION TONS of CO2 and CH4… with absolutely no context or comparison to alternative emission scenarios such as leaving an old-growth tropical forest in place. It’s in Spanish — so it’s not for everyone. There are other protests and videos out there regarding the latest project — which ostensibly is to “preserve and protect groundwater resources. I can’t say a lot more because I have a dog in the hunt. The guy talking about how they can no longer cut down trees for firewood may be working against himself. I’ve seen lots of forests in Central America severely damaged by the need for firewood. It could be that some regulation was needed, but this seems to be turning into a land grab. Pfft… good luck. I doubt we’d ever get there. Agreed. Earth’s CO2 levels were 4500 ppm once and still didn’t match up to the kind of runaway greenhouse effect the climate delusionists spew. If this is true, then where is the study showing us all the cooling from all those swamps humans have drained over the millennia? Wheres the paper showing this interglacial was supposed to be as warm as the last except we drained all the swamps. I trust everyone knows that the Methane in the atmos is being measured in ppb, so that 1700ppb is in fact 1.7ppm. Ya know, when you puff up an issue high enough, even British MPs and EU bureaucrats start to ignore the gang green. I think there needs to be a consortium of independent technical aid funds that will help build your coal fired electricity plants and dams in developing countries. There should also be a newspaper circulated in these countries laying bare the green neocolonial masters’ plan for them that says their aspirations and even their lives have to be sacrificed. India and Mexico have been the first to kick these NGOs out and make illegal any foreign donations to their local activist chapters is illegal. Awesome…hope that catches on in more countries. In particular, there are rising indications that Nam Theun 2 and its massive 450 square kilometer reservoir are responsible for massive amounts of greenhouse gas (GHG) emissions,…. How many million tons of ‘massive greenhouse gas emissions’ (MGHGE) would the original, unmodified forest have emitted across this same 450 square kilometer area? 450 Square kilometer? Did they drop a 0 or something that’s only 13 miles by 13 miles (172 sq miles) Toledo Bend Reservoir on the border of Texas and Louisiana is twice that size. Once the termites go to work, the methane jumps almost exponentially. Actually the author Melinda Boh is a pseudonym of an individual living in Jakarta who has a hate on for Laos. I think that the article is more of a world opinion weapon against Laos than an actual statement of concern. How is methane an issue? The way I understand it, methane absorbs the same energies that water vapor absorbs and our gravity bound heavy gasses keep us at a temperate level, water vapor has already saturated the atmosphere to a point that methane has no bearing. How is it they say methane is a problem to begin with? If the main problem is the vegitation that is left in place during the initial flooding of the dam and the bacteria that flourish on it, the solution would be to clear cut the area beneath the water line prior to dam completion. You would gain a valuable resource in the trees, force the wildlife into upper habitats and remove most of the source of the main threat of initial CH4. The trees that are flooded are only going to decay once so that has a limit and can be calculated. The organic material that is washed in by rivers and rain would have gone to the ocean or be deposited in deep pools and decayed so that is a zero sum. They can count the drowned trees once and nothing else. After the original trees are decayed they have a power source that produces no methane. The stuff washing down after the dam is built would have washed down (and produced methane) whether or not the dam is built. The stuff ‘drowned’ by the flooding of the dam should be a once only affair. And, offset against that, is the saving of emissions by the populace being able to use electricity for the first time. These people are on a one track evangelical trip. Per MJPenny & Kohl, above ( I trust – still getting used to the thread set-up, and apologies if below), this looks a pretty sound investment. Plainly something the solar/wind/tree-huggers cannot abide/accept. Jeeze, just seed the frickin lakes with Methanotrophs for Einstein’s sake, where are the biologists? Don’t enviromentalists use science anymore? So what is 4% of immeasurably small then? The total mass of Earth’s atmosphere is about 5.5 quadrillion tons. Tumbling Turbines, my good correspondent! That’s one part in twenty-five of what’s sending this planet . . . . to . . . . um . . . . tomorrow. Well, -ish, I suppose, approximately. So, probably a fairly likely maybe, perhaps? Apologies if I lack the conviction of some of the serious water-melons. I guess my heart isn’t in it. Let’s not visit the gross pathology. Let us go whole hog, eco-nasty on these evil works of man. Hydro electric water reservoirs apparently damn the “free spirit” of the river, stop salmon runs and the weight of all this water has caused measurable wobbles to the earths spin. Something to do with life being a sexually transmitted terminal disease.Probably the reason these bedwetters have nothing better to do with their time than whine about the eco-castrastophe of breathing. Just like the solution to banging your head against the wall, the solution to their imaginary pain is obvious to me. Perhaps it is too much to ask, but these clowns would be a lot more convincing if they practiced what they preach. Melinda Boh Friday.. is this a real person or another persona created for effect? Environmentalism is all about mentalism now and clueless with respect to our environs. I am starting to think there is no recovery for the activists of this cause. Log them first – so no methane emissions and saving other forest from logging. None of it is rocket science – or at least that’s how it seems to me – but common sense is alien to Eco-warriors, no that’s wrong they avoid it as it doesn’t suit their purpose. Wind and solar are pointless unless the energy can be stored and released on demand and battery technology is too inefficient, too expensive and too polluting; so position them where the electricity generated can be used to pump water up to reservoirs and used to generate electricity when required. Alternatively use it for electrolysis and generate hydrogen to be stored and burnt as fuel to generate electricity on demand. Better still work on safe nuclear that is scaleable down to town / community level (thorium as one example) avoiding expensive distribution and control systems. Go down those routes not because of the global warming scam but because if done correctly it is a better alternative and far better for society than the Eco-activist approach of destroying economies and condemning the third world to financial hardship, starvation and low quality lives. Like any scientist I didn’t check my common sense first, I assumed there was some reason they didn’t log it off first. Thank you! The biosphere has been measurably greening due directly to the rise in beneficial CO2. That increase in vegetation has been at least 11% so far. With that increased plant mass, when it dies and decays, additional methane must be emitted. Therefore, we see methane increasing. But that is entirely natural, and nature quickly eliminates it. The added methane causes no global warming. Methane is converted to H2O and CO2 in a matter of days to weeks. It is simply not a problem. It obviously causes no global warming, because global warming stopped many years ago. This is just another false alarm, along with the Polar bear scare, and the “acidification” scare, and the accelerating sea levels scare, and the Arctic ice scare, and all the rest of the invented climate crises. None of these false alarms ever happen. They are self-serving alarms, fabricated by rent-seeking alarmists. Those who have disregarded them have been on the right track all along. Methane doesn’t remain in the atmosphere very long, either. 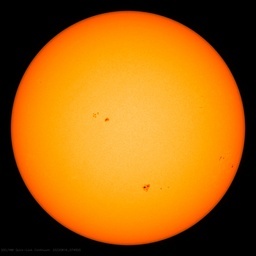 So let’s do this now while global warming is on hiatus. 1) I agree, Anthony – someone on the “Stop the Dam” team was given the assignment “find some way that this dam will cause global warming” and they did the best they could, given no evidence. 2) This highlights the fundamental problem with using “carbon pollution” as the buzz phrase for environmentalism. There is some real rationale for preserving deep-earth carbon sources, and if the policy nitwits were saying “leave some deep earth carbon for our grandchildren” then I would agree. And it would encourage people to develop renewable energy. And no one would wonder whether dead trees were part of the problem – because deep earth carbon is not involved in the flooding of a dam. Years ago there was a newspaper story on “Earth Day” about people all over town eating dinner by candlelight to reduce carbon pollution. The irony was that most of those candles were paraffin, and the electricity they were preserving was 95% hydro. I consider myself a conservative, a CAWG skeptic, and a supporter of development for the third world but, at the risk of being clobbered, I have to say that dams do a lot of damage, no pun intended. They provide power and water storage, but destroy fisheries, forests, and many communities, especially poor and politically weak communities. There are some difficult trade offs. I would rather help fund a big nuke plant for them, but that is usually a non-starter. I like the iconic beaver too Justin, as long as they are kept on your land or crown land and not flooding my hay fields and pasture. Lots of rodent control needed out my way and they breed like rats … Sometimes they provide flood control … and sometimes they cause massive flooding. Absolute rubbish. Different kinds of dams produce different environmental impacts. “Run of the river” dams have small holding ponds, if any, so no land is being flooded and no trees being destroyed. The largest hydroelectric dam, the proposed Grand Inga Dam project on the Congo River which would have more than twice the output of China’s Three Gorges Dam, is a “run of the river” dam with no storage. P.S. the Congo Rivers is in a “tropical location”. That is a great graph of methane over time. What is the source? Note: the graph caption doesn’t show up on either my PC screen or Ipad screen (even when using FIND). I was referring to the graph in this, the methane post. 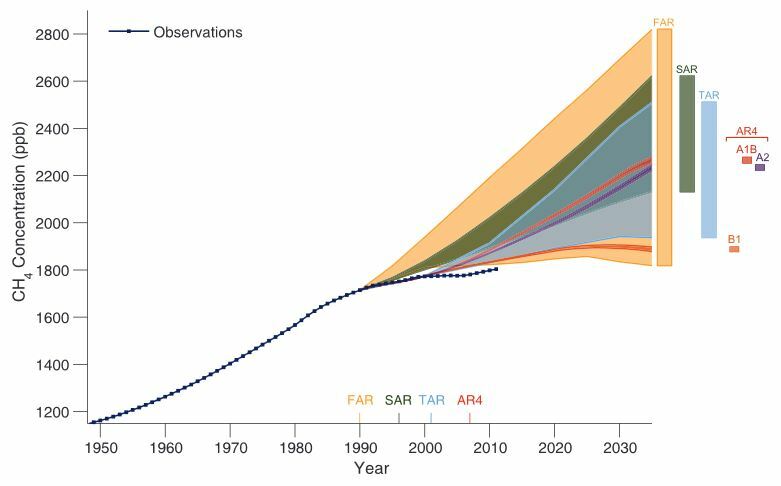 I suspect you refer to the graph in a later post — about ozone. I’ve made that mistake. It’s easy to do when using the WP Dashboard’s comment page to handle multiple comment threads. Thank you for the citation. That’s a powerful graph; in a sense more so than the global temperature vs models. If it didn’t make the final version of AR5, what could have been the justification? It seems consistent with the somewhat skeptical tone of WG1 – 2.2.1.1.2 Methane. 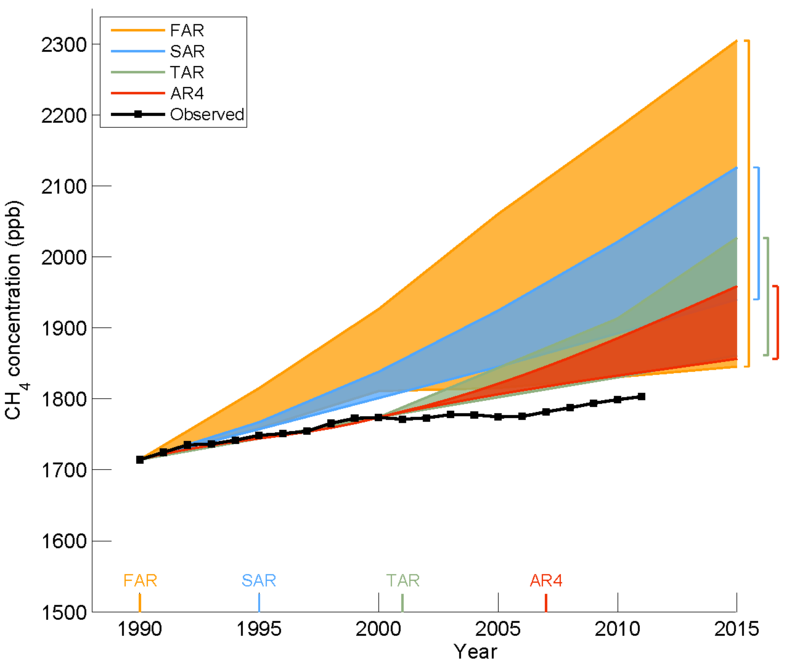 Suggestion: rather than the draft, use the graph from the final AR5, Figure 16 from Chapter One of WG1. Speaking of methane emissions in South East Asia, has anyone calculated the emissions from millions of hectares of rice paddies fertilised by millions of tons of recycled human waste? It strikes me that a few tens of hectares of drowned forest pales into insignificance compared to that. Colonial EPA? They’re in the harbor. Under the tea. …emissions, amounting to as much as one million tons of methane and carbon dioxide per year, according to recent independent academic studies, including a statistical assessment produced by the US’s Duke University. Every time I see a new eco-report out of Duke University, especially one damning progress that they haven’t directly profited from, I kind of have to wonder. There’s likely a thick firewall now between the present-day university and the family business empire, but it was Duke founding grants that got the university started. James was the first donor. Sons Buck and Benjamin Duke were the businessmen who set up the first hydroelectric dam on the Catawba River to energize their tobacco mill (a fact omitted below). The rest is history. Duke Energy is the largest electric company on the East Coast. Duke Energy’s hydroelectric power plants in the U.S. provide approximately 3,525 megawatts of renewable energy to help meet our customers’ demand for clean, reliable and affordable electricity. Duke Energy began its operations in the Carolinas as a hydroelectric company. Harnessing the water power of the Catawba River, the company’s first power plant provided electricity to the area’s emerging textile industry, and later, the region’s growing appetite for the convenience that electricity could provide. Today, Duke Energy is the second largest investor-owned hydroelectric operator in the U.S.
Hydroelectric assets also constitute more than 70 percent of Duke Energy International’s generating capacity in Latin America. 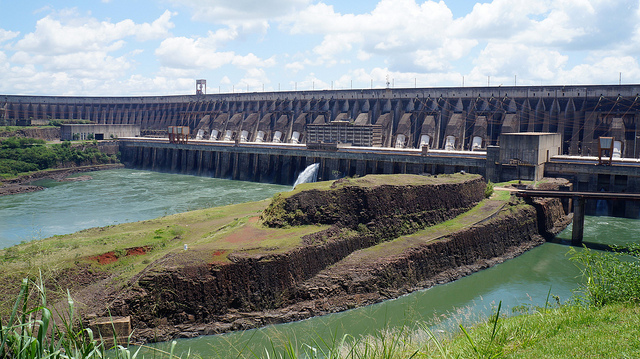 Our hydroelectric facilities in Argentina, Brazil and Peru can produce more than 2,900 megawatts of electricity. Dams on the Mekong ”might” damage the ecology, but WILL improve the lives of millions by the supply of reliable electricity and reliable water supply. Rediculous, like the metnane wasnt going to be released later over time anyways! I would also like to convey that most people that find themselves without health insurance are normally students, self-employed and those that are out of work. More than half in the uninsured are under the age of Thirty-five. They do not come to feel they are wanting health insurance because they’re young as well as healthy. Its income is frequently spent on homes, food, as well as entertainment. Some people that do go to work either full or not professional are not supplied insurance by their work so they proceed without due to the rising price of health insurance in america. Thanks for the strategies you discuss through this website.